Earlier Claas combines and balers had been trialled and sold in the UK in the 1930s but not in significant numbers. In 1946 after Germany had been split up by the Allies, the Claas factory ended up in the British Zone. 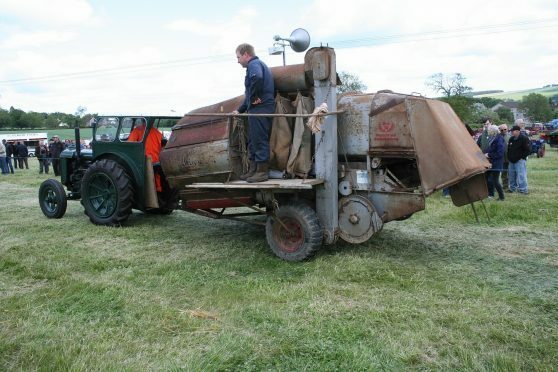 A Scottish Army officer, and possibly farmer’s son, Ian Fleming, who later did a great deal of work with the Scottish Museum of Rural Life, came across one of the new Claas Super trailed combines. The board of trade was alerted and one was shipped to the UK for evaluation by the National Institute of Agricultural Engineering (NIAE) at Askham Bryan, near York, in 1946. The director of agriculture in the British Zone – Harold Walston, and later Lord Latson, who was the father of well-known Cambridgeshire farmer and broadcaster Oliver Walston – also visited the factory and was impressed by the combine. His son still uses Claas combines today. In 1947 Roy Wieck, of the Board of Trade, confiscated 11 combines as part of war reparations. He offered them to several UK machinery concerns who all turned them down. He then offered them to J. Mann and Son of Saxham in Suffolk. They had been handling the German Lanz tractors before the war and then Oliver equipment during the conflict. After the ending of Lease Lend in 1945 they were without new machinery to handle and the call from Wieck came out of the blue. After Bill Mann had gained assurance from the NIAE on the combine’s ability he agreed to take them and subsequently sold them all. August Claas’s son Helmut came over with the first combines and translated all the parts and instruction books into English and organised the spares store in a former pigsty. It is also believed that Ian Fleming had organised a shipment of combines to Scotland where they were handled by SAI from their depot in Haddington, south of Edinburgh. The following year 50 combines arrived and year on year the number increased and the distribution network was streamlined helping Claas to become a dominator of today’s harvesting scene.